Old-world allure: These varying black and white Glass backsplash tiles are combined harmoniously to give the kitchen an inviting old-world chic. The backsplash displays a mosaic tile niche with the distinct features of tiles that are different in scale for added interest. Dark-brown wooden cabinets also emphasize the aged character of this homey kitchen. 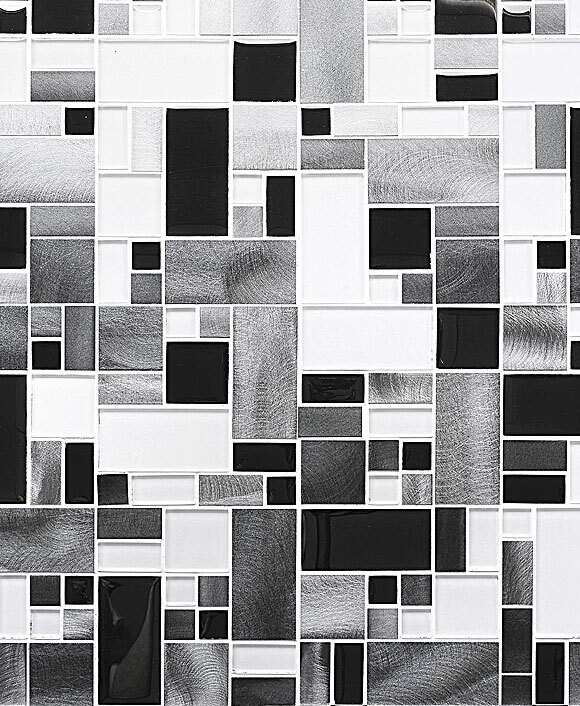 See products black and white backsplash tile. Photo Credit | Other Metro Interior Designer Atmosphere Interior Design Inc.
Textural milieu: The black and white mosaics tile bring a glossy modern-day mode to this kitchen’s backsplash. The thin, tapered tile accentuates the simplified design of linear angelic-white kitchen cabinets with black pulls that blend well with the glittering black countertops. The black and white color combination works well to make this kitchen inviting and relaxed. Also you may consider using white black glass backsplash. Neutral stage show: The sophisticated and contemporary look of this kitchen is made possible by combining perfectly designed black and white custom designed backsplash tiles and pure white cabinetry. The speckled black and white countertop ensures that the kitchen looks exciting while at the same time maintaining a neutral color palette and a warm welcoming mood. Fusing color scheme: In this kitchen, black and white diamond pattern mosaic backsplash tiles are used to pull together a wonderful scheme. The duo-tone mosaic tile backsplash in the kitchen unifies the pale grey hued cabinetry with the white stripped countertop at the center and the shiny black one enjoined to the wall for a rich ornate touch. Sparkling focal point: A unique tile backsplash can introduce a bit of vintage charm to your kitchen and convert the cooking space into a design showcase. These black and white ceramic backsplash tile adds a glamorous touch to the space, harmonizing the room’s flamboyant speckled granite countertop and white kitchen cabinetry. The stainless faucet and other additional appliances blends well with the natural surface and soft colors shimmering in the natural light while remaining neutral enough. Also you may consider to use white and black glass subway backsplash tile. This entry was posted in BLUE, MARBLE, MOSAIC, SUBWAY, TUMBLED HONED, WHITE. Bookmark the permalink.